Target Tights first appeared on Chictopia's streetstyle gallery in Summer 2008 seen on New York blogger Bonnie of flashesofstyle.blogspot.com. She styled her Target tights with a Anthropologie dress, Payless shoes, and Forever 21 necklace. Since then, Target Tights have grown in popularity as bloggers from San Francisco, Los Angeles, and Grand Rapids have discovered them. Target Tights are generally seen in casual, eclectic, and chic style. Popular types of Target Tights are tights, lace, sheer, polka dot, and opaque. Blogger's favorite colors are black, gray, white, and blue. There are currently 2945 streetstyle photos of bloggers wearing Target Tights. 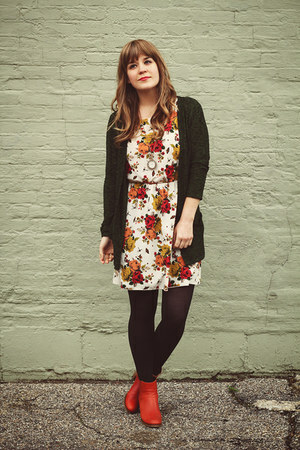 Most recently, blogger selectivepotential of selectivepotential.com styled her black Target tights with a tawny Wolverine boots, ivory kintage dress, and dark green Urban Outfitters cardigan.